I was 7 months pregnant and rather large and in charge when Halloween came around. I was trying to think of a clever costume that would take advantage of my big belly and that wasn’t something that EVERY pregnant person has done. So I had the robe and the hat, they were gifts from my aunt. I wore my plain black maternity pants and a long sleeved shirt underneath so I was warm. I wore white socks with flip flops to match. I put sneakers on later because it gets cold here in MN. It is hard to see in the pictures but I used black eyeliner and made wrinkles near my eyes, and colored in my eyebrows to match my stache. The mustache I purchased at my local Halloween store. For my hair I pulled back for most of the day. 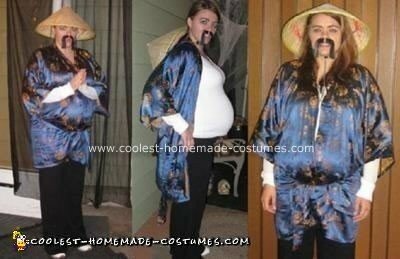 Everyone at worked loved this Confucius Mother to Be Costume and I even won Most Creative for our costume contest. For an added detail if you can recite some of Confucius’ wise sayings it adds a nice touch.